It was a busy weekend on the UK tournament circuit with a couple of high profile live events taking place. The big winner was Daniel Marks who took the honours in the latest leg of the £150,000 Deepstack series at Dusk Till Dawn in Nottingham. The 21-year-old turned his £300 buy-in into £36,000 after working his way through a final table that included Tom Hall, DTD reg Latif Patel, WSOP casher Alfie Adams and January DTD Deepstack runner up Vik Mehta. Marks is no stranger to online success with scores of over $100,000 to his name and he sealed his biggest live payday to date after defeating DTD regular James 'Raggy' Clarke for the title. The youngster sealed the win when his A8 held against Clarke's A4. Further north, the latest leg of the Sky Poker Tour took to the tables at Aspers Casino in Newcastle with Richard Knibbs becoming the talk of the Toon. 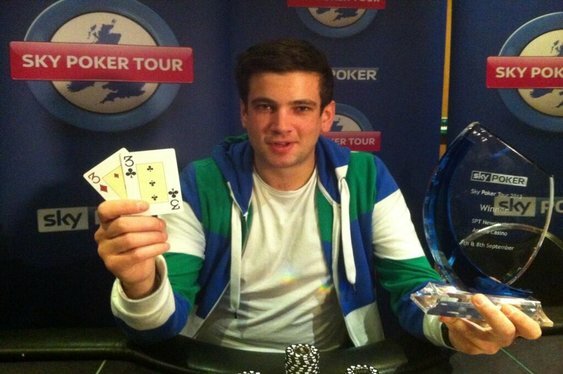 Knibbs pocketed £5520 after outlasting a sold out field in the two-day, £200 buy-in event. He claimed his first major live title when his pocket threes held against Paul Wolyczsn's A2. All that's left on the 2013 Sky Poker Tour is the season ending Grand Final on 26-27 October. Satellites will up and running at Sky Poker shortly. Image courtesy of Sky Poker.